World Record Breaking balloon artist, Brian Getz entertains at corporate events, parties, ministry events, and more. He also astounds through creative and classic balloon decor. With twelve years of experience, Brian's professional approach, comedy and creativity will make your next event a success. APCA's 2015 Novelty Act of the Year, Brian has performed in 26 states and 14 countries. 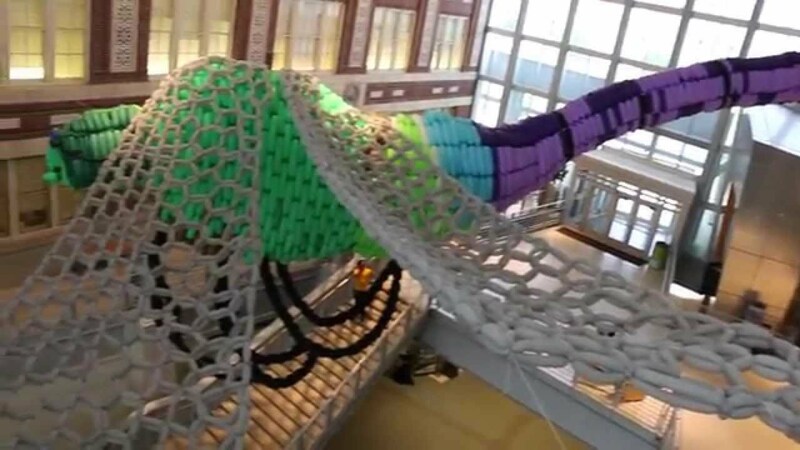 His signature Super Sculptures include an 88 foot dragonfly, the largest balloon sculpture in the world. He engages community volunteers to create huge installations at universities, nonprofits and corporations around the country. Now providing balloon entertainment, balloon decor, face painting and more. The balloons were a lot of fun! We had a lot of kids at our event and they really enjoyed the balloons. I'm glad to hear everyone enjoyed the balloons. Is there anything that made it less than 5 star service? Pretty Funny Balloons are Awesome! We will definitely use this couple again! They had such a long line! Everyone loved them! Brian and Christina did an amazing job for our Homecoming and Family Weekend! We were so pleased with the mascot they built for us and would definitely bring them back again. Young and old loved the balloon structure and it held up for quite some time. It definitely added a "wow" factor to the weekend! Brian was such an excellent entertainer. The guests (adult and child) at my wedding reception LOVED him. He kept everyone smiling and he definitely elevated the mood during the small bit of chaos that goes with weddings. I will forever recommend Brian and Pretty Funny Balloons. I hope I have another big event that we can hire him to entertain! Christina did a GREAT job entertaining both the adults and children at my son's 6th birthday party. She was able to create a Darth Vader balloon cape and mask with a light saber for my son who loves Star Wars. He loved it, and all of the children received at least 2 unique balloon creations to enjoy during the party. She also did some fantastic face painting that made the even both fun and memorable. We will definitely use Pretty Funny Balloons for a future event! Brian was always punctual, great with kids, and super talented. Great to work with and very responsive! Brian helped me to give a very personal and funny gift for a 50th birthday. He suggested creative options, created the gift and made a very timely delivery. Brian is great to work with and I plan to order from him again in the future. It was 3pm on a Friday afternoon when I received a call that the petting zoo I had scheduled for my daughter's 3rd birthday was no longer going to make it...did I mention her birthday was the very next day! In a slight panic, I began to research alternative options. I stumbled upon Brian's Balloons and within 30 minutes of submitting my inquiry, I received a call back from an amazingly friendly gentleman...owner and operator named Brian! Brian listened to my rambling and despite being outrageously busy that very weekend, he reassured me that he could help and provide the 30+ kids I was anticipating the time of their life. Although he could not make it to my party himself, his beautiful and talented fiancé Christina was sure to be there. So here is what makes it even better. Christina was already booked up most of that Saturday. Somehow, she managed to drive across town, during the small window of down time she did have that day, and put on an incredible show that both the children and adults loved! You guys were truly life savers and beyond talented. We cant thank you both enough for saving the our party and doing so within less than 24 hours notice! Brian was great! He always had a crowd around him and kept cracking jokes that were hilarious! His ballon twisting is also really really good! Like pro status! The students at Fillmore Elementary had a blast with Brian!! He had then laughing, playing and learning! We really liked how he tied in how important school is. The students loved making their own balloon!! Thank Brian!! 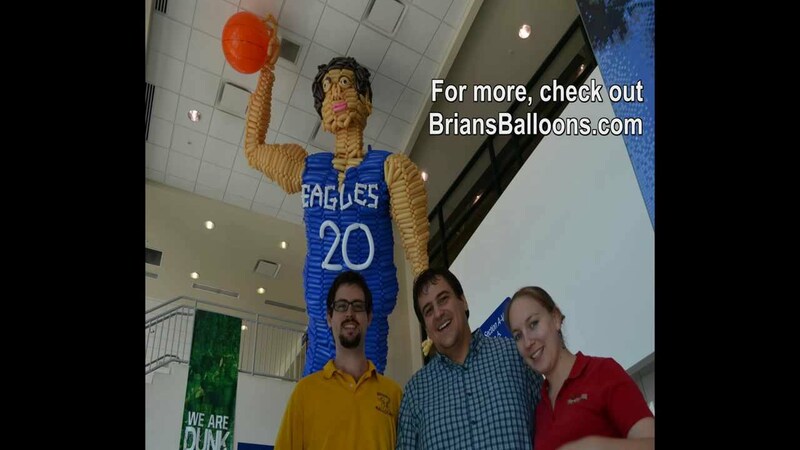 Brian's balloons was a great event on campus and the whole university enjoyed the finished product. Brian's Balloons has the best balloon decor to match any of your events. Not only did Brian's Balloons provide colorful decor for our Empower Success Summit, but they did it successfully with only a 4 day notice. The delivery of the balloons was seamless with on time delivery and set up. Participants of the summit loved the balloon decor so much they opted to take the balloons home as a gifting item. Brian's Balloons came out for our annual open house holiday party at our retail store in November of 2015. I know every child adored their creation made by Brian. Brian was so professional and great to work with. I would definitely recommend Brian and his team to anyone! We will be using them again! Brian was amazing. Extremely professional, charismatic, and great at what he does. No one was able to stump him! Thank you so much Brian for all you help in a very short notice. You can through for us even with a very late notice of an add on. We very much appreciate you and your company. We will definitely keep you in mind for future needs. Great working with you and your team. Aaron of Brian's Balloons provided excellent service to the families at our annual church picnic. He was on time, friendly, super talented, and eager to please. We wouldn't hesitate to work with Brian's Balloons again. Thank you! We were thrilled to work again with Brian, and on his birthday no less! Brian was a joy to be around, not only was he flexible but he we generous and funny. Our students were happy to have his services at our event and we were beyond excited with the finished product of our 18 foot tall version of our mascot. I would recommend Brian strongly to those who want to bring something fun and new to their events! I work at Riverwalk Commons in Noblesville IN and have hired Brian for several years to entertain at difference events we've had. Everyone loves watching him make all different types of balloon creations. He's wonderful with our residents and their families as well. He's definitely been an asset to every event we've had. Everyone always asked if we're having "the balloon guy" again. I'd highly recommend Brian for ANY event you're having. He's sure to entertain everyone there. I am the mother of a bride that had her wedding at The Madame Walker Theatre on August 8, 2015! Since we come from Kansas and the wedding was held in Indianapolis, I needed help in turning the ballroom into a 1920's Gatsby Party! Brian's balloons was a huge help in transforming the ballroom into the perfect 20's Party! Brian was awesome when we had problems with the balloons popping due to the ceiling surface and he quickly gave me options! His staff was just as professional and EVERYONE loved the look! Thanks, Brian's Balloons! Brian was great with the kids and made awesome balloons!! Fantastic balloons, for kids and adults! Wonderful - almost over-qualified for a kid's birthday party! Prompt, pleasant, excellent communication. Professional and very prepared. And of course, so talented! The kids had a great time, but the adults were totally blown away by his creativity! Brian, did Expressenz Dance Center's recital last year. He did an amazing job tying our theme together which was jungle/safari theme. He is very talented and takes his work/craft very seriously. We will be using him for years to come! Brian helped us erect a Griffin to celebrate our inauguration of a new president. The Griffin looked great and definitely captured the attention of our campus community. Guaranteed entertainment for any event! We had Brian come to our college campus after meeting him at an APCA conference. He was on campus the entire day to build a giant balloon sculpture of our mascot, the Griffin, and we were not disappointed! 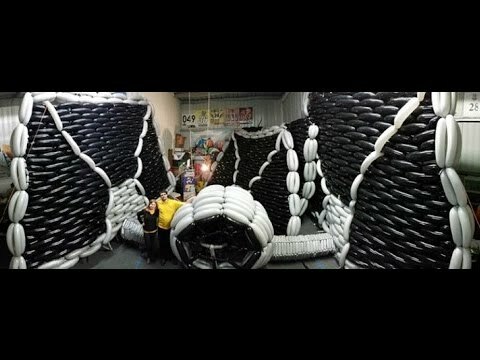 No matter what walk of life you come from, you can't help but stop and stare amazingly at the things this guy can do with balloons. We even had Brian do mini balloon sculptures of our college president and her 2 dogs- which she got an absolute kick out of! We received nothing but positive feedback and amazement from everyone who walked by as we created our balloon griffin. 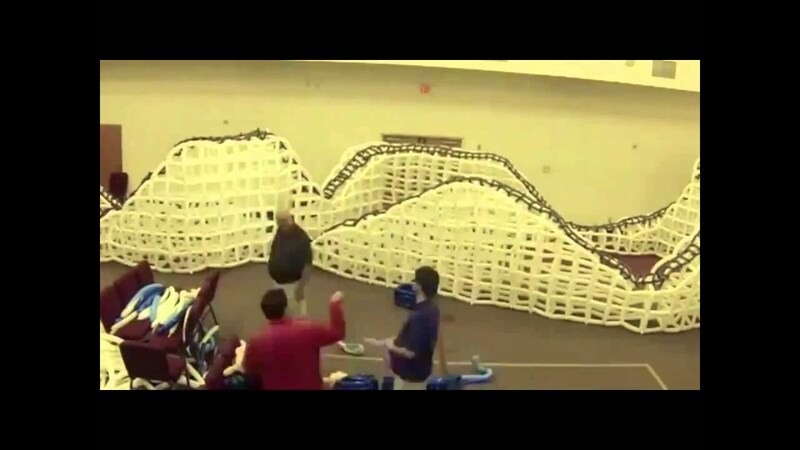 The best part is the student involvement that Brian incorporates into his creation; students are involved in the entire process, which they love! I would recommend Brian for any event! We had Brian come for our church's kid's club. He did a great job keeping the kids attention the entire time through games, hands on learning and a great message about the Corinthian church. His form of entertainment was enjoyed by children and adults alike. We hired Brian to twist balloons for our church's annual Easter egg hunt. He was professional, very talented & fun. He's wonderful with children (loud, excited children!) and impressed them with his skills. I'm looking forward to having Brian's Balloons back for our next event. Brian was professional, and helped us stay within budget for our event (which is greatly appreciated at a charity walk). The balloon arch was a great way to mark our starting line and looked wonderful. Brian's Balloons was a huge hit with all of the attendees at our community awareness event last May! Very creative, artistic, and inventive, I don't think there was a request he couldn't fill! To sum it up, we were privileged to have worked with him and would recommend Brian to anyone! Brian is super talented and loves to go above and beyond and try new exciting designs. Anytime someone is looking for something different & fun for their event I always recommend Brian! I am a full service balloon professional, meaning I can provide balloon entertainment, decor, and specialized art installations. Entertainment: I can do roving or stationary entertainment for crowds of all ages. I tell my clients that I can make "anything" and I mean it. I will take requests from guests or encourage them to get a surprise. Each and every balloon comes with witty humor and fast-paced entertainment. I pride myself on both my speed and my creativity, making larger and fancier balloons than anyone around. -I'll lead some age-appropriate balloon games for the kids, based on their ages, attention spans, and the space. -I'll teach every guest how to make a balloon dog or sword so they go home with a second balloon they made themselves. -I'll top it off with an outrageous hat for the birthday kid while everyone eats cake. Decor: I can provide whole party decor, including arches, columns, helium bouquets, balloon drops, photo backdrops and more. My years of twisting experience allow me to create truly unique balloon decor. Contact me for specific pricing. Signature Super-Sculptures- I am best known for my enormous twisted creations like a 30 foot rocketship, a 3000 balloon roller coaster or a full-size biplane. I can create unique sculptures for corporate events, university programs or nonprofits. Even better, I can make it a fun, team-building exercise, leveraging community volunteers to create huge designs in a single day. Brian started twisting balloons 12 years ago when his twin sister got him a kit for Christmas. He worked his way through college and master's studies, before jumping in with both feet. He likes to say that balloons were a fun hobby that became a fun job, and then a fun career. Balloons have taken Brian all over the world, from mission trips to Kenya, Bosnia, Slovakia and Uganda to working in Canada and the Caribbean, this skill has really opened up doors. Recently, Brian has been working a lot in the college market, traveling the country and working with students to create some truly enormous works of art. Based in Indianapolis, Indiana, he enjoys woodworking, hanging out with friends and meeting other entertainers. His newest project is a world record attempt scheduled for June, a dragonfly with a 90 foot wingspan at the Indiana State Museum. When entertaining, all I really need is my custom balloon bag over my shoulder. A chair or table can sometimes be handy too. I'm pretty low maintenance. For Decor or Super-Sculpture builds, contact me for specific details and restrictions.